This weekend we had a larger, more diverse gathering of workers than ever before. I went out early to get set up and organized before Jeff came back to help wire the solar panels, and I arrived to find that my logger neighbors were already well into their work. Turns out, Sandy’s son had the thanksgiving weekend off, and what better way to spend time with Dad then cutting down some trees? They MUST have started right at the crack of dawn, because I showed up at 10:00 to find that they’d already felled three of the four trees directly in front of the house, limbed them, cut them into rounds, and loaded them into the trucks. I’m telling you, these guys are FAST. We exchanged some pleasantries, then I got to watch them take down the last one. It was like clockwork: they hooked up a safety cable and pulley to make double sure it didn’t go towards the house, fired up the chainsaws, and second the tree came whooshing down to the ground. It’s weird how much noise they make as the branches sweep through the air, before they even make the big CRUNCH at the bottom. Then, with three chainsaws going at once, they dismantled the fourth tree and loaded it up too. 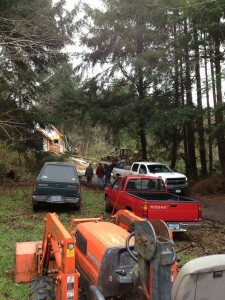 As this was going on, I heard a new engine noise competing with the chainsaws, skidder, and pickup. It was Lance, our farmer friend across the street, coming up the drive with his tractor. Sandy smiled when he saw Lance, and they talked for a bit- I love the way everyone around here knows each other. Then, Lance took Emily down to the lower field to give her some Advanced Tractor Training. He’s been very generous with lending us his equipment, and we all wanted to take advantage of the unseasonably dry weather we’re having. 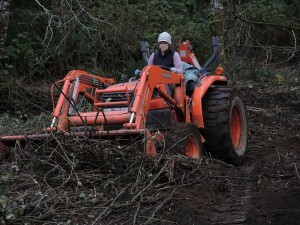 Emily did not waste the opportunity; in about 5 hours she cleared over 30,000 square feet of blackberry to start getting us ready for spring planting. Here’s a picture of her having serious fun, using a little hydraulic muscle. While she was working below, Jeff and I were busy running the wires that will connect the solar panels to the battery and inverter. 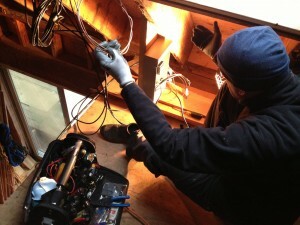 Here we see Jeff connecting all the leads from the PV cells into the collector box. It’s a little enclosure with DC circuit breakers, that brings together all of the individual wires from the PV array and consolidates them into one thick set of cables that goes back across the house and down to the inverter. Running all that wire was pretty time consuming, and we have about one day left of tinkering to hook up the batteries. Then we should be operational! About the time the lunch bell rang, Ryan showed up to chitchat and check up on the work. As I was steaming the tamales, Emily and Lance came back up the hill, and we all stood around eating and chatting. Ryan has known Lance for years, but it turns out he also had met Jeff before at an office party- their wives both work at the same hospital! Small town indeed. 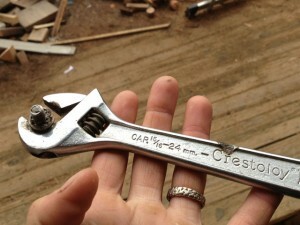 One last thing: Jeff brought this wrench for all of us to see. He was working on a solar power array many years ago, and the nut on the main terminal broke loose unexpectedly as he was tightening it and the wrench handle touched the other terminal. It arced, burning a hole in the wrench at one end and welding the nut to the wrench at the other. He got pretty lucky and was unhurt, but he has kept the wrench forever more to remind people to be careful when they are working on big batteries like the ones we have. Yikes! 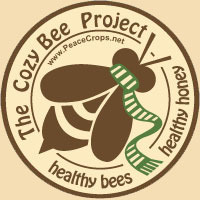 This entry was posted in Construction and tagged blackberry, logging, solar, tractor. Bookmark the permalink.